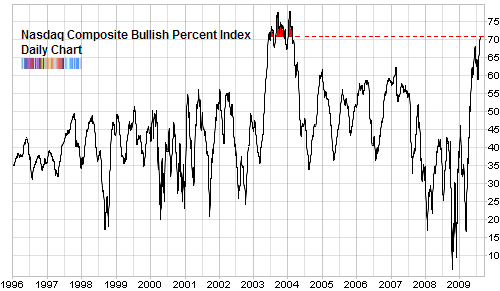 Bullish Percent Index: Overbought Or Bull Market? One of my favorite breadth charts is the Bullish Percent Index. It isn’t as common as advance decline measures because it is based on point and figure charting. Point and figure charting itself is based on pure price action and ignores both time and even small price movements. In P&F charts the X represents demand (or bid or buying) and the O supply (or selling). Unlike candlestick or bar charts, it is perfectly normal for a point and figure chart to not need to be updated (when price doesn’t move beyond a threshold either up or down). This is the great advantage of point and figure charts. Other than that, the basics of technical analysis such as support and resistance apply to point and figure charts. Also, point and figure charts can provide systematic buy and sell signals - something that ‘normal’ charts leave open to the traders discretion. The simplest buy signal is the chart to the left - when price breaks above a previous high (without the column of O’s breaking below their previous low). So to calculate a Bullish Percent Indexes, we simply take a look at each and every stock compromising an index and track how many of them out of the total constituents are in a point and figure buy signal. If, 120 out of the 500 stocks in the S&P 500 index are in a buy signal for example, then the Bullish Percent Index for the S&P 500 for that day would be 24%. According to the traditional interpretation, a Bullish Percent Index of 70% and higher is considered overbought. And if there it experiences a 6% (or more) decline, it will offer a sell signal. Personally, I prefer to not wait for the sell signal. Once you know that the market has weak legs, you can use other indicators to give you more short term guidance. Right now we are seeing almost every single measure of the market provide extreme breadth levels from the Bullish Percent Index. Normally seeing the bullish percent indexes for so many markets and sectors reaching this high in synchronicity would be a red flag. However, there is an argument for such strong momentum to be a signal of a protracted rally. This was the same concept that I shared earlier this week about incredibly powerful thrusts measured from the advance decline breadth. These short busts of powerful buying are usually precursors to lasting uptrends. Think of it as a turbo booster on a rocket which lifts it through the heavy atmosphere before it can glide easier through the thin air of space. Consider that the last time the Nasdaq composite BPI was this high was back in 2003-2004 during a powerful bull market. It is the same case for the NYSE, and the Nasdaq 100 index. This is how overbought can become meaningless. Or could one counter given the extent of the drop into March and the subsequent sharp recovery that it would be ‘easier’ to generate point-n-figure buy signals? One thing I don’t like here about this rally is that it’s a year too early for a cyclical bear market to complete (and this would be conservative, this bear phase could go into 2011 or longer if it went the distance for cyclical markets). What I do like is the breathing room the rally has given for a downward leg. If the market was to trade sideways for the coming 12 months, using March lows as a support anchor, it would be very healthy. On the plus side, we are seeing leadership in the typical recovery sectors like Financials and Technology. For our business we would love this to be the start of something positive! Declan, yes, as usual you have a very good point. We can compare it to other extreme waterfall declines, like post 9/11. But it isn’t similar. Your second point is valid as well and it is probably the single reason for being cautiously optimistic. For even if we do decline heavily, we have strong support as well as a recovering long term trendline (200 day moving average). In that situation, as long as we maintain above the previous low, we can still say that the bear market ended in March 2009.
do you produce the values of the index yourself? or do you retrieve from some other source? i’ve been trying to find the components of the energy bullish percent index. the closest i’ve come is that it is made up of 39 stocks, but i have no idea which stocks they are. i would also like to know the components of the gold miners bullish percent index. any help would be appreciated. thanks! Tom, the S&P website doesn’t have any info for the energy sector but you could use the XLE ETF instead since it tracks it relatively closely. I don’t think the components will be that different - depending on what your intentions are. I’ve asked around and if I come up with anything better I’ll let you know. I don’t think that StockCharts has one for the gold miners; you would have to find the components of the GDX (go to the Market Vectors site), and then look at their point and figure daily charts and see which stocks are bullish. I checked with stockcharts and they say that S&P doesn’t publish component data for that sector - which is really strange. I’d follow up and ask S&P directly.